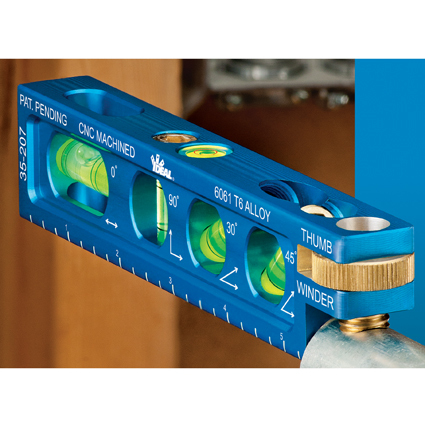 IDEAL Electrical new Precision Levels are designed for both conduit and regular level applications, providing some of the most accurate features in the industry. Entire chassis is CNC machined from 6061 T6 aluminum billet for straightness. 3.5” and 6” levels feature an integral Thumb Winder™ conduit wheel with a contoured screw designed for non-slip grip and stability that prevents doglegs in complex conduit bends. Corrosion resistant brass screw for easy vial replacement instead of plastic or glued caps. Oversized neodymium rare earth magnets provide the highest magnetic field strength and stability. Bottom surface features a v-groove for conduit surface coverage and holding power. Each level features a bull’s eye vial to align X and Y axis points. Adjustable torque screwdriver used for assembly and maintenance applications in accordance in 2017 NEC.